​Kids can find lots of things to do at the Wings Over the Prairie Festival. One of the most popular events for young people is the annual Carnival & Midway sponsored by Scott Manufacturing, Inc. There is even one day set aside for kids to enjoy the Carnival & Midway. Special times have been designated as Armband Days at the Carnival. Although it's geared toward kids, anyone can buy an armband for only $17.00, entitling the wearer to ride all the rides any number of times. Armbands are only good for Wednesday or a rain date if there is inclement weather. But you can ride all the rides until you're dizzy if you want, during designated Armband times and dates. Wednesday, November 21 - 5 p.m. to 9 p.m.
Thursday, November 22 - 5 p.m. to 9 p.m.
Saturday, November 24 - 2 p.m. to 7 p.m. The Carnival & Midway is operated by one of the state's best known carnival companies, Miller's Spectacular Shows, of Greenbrier, AR. 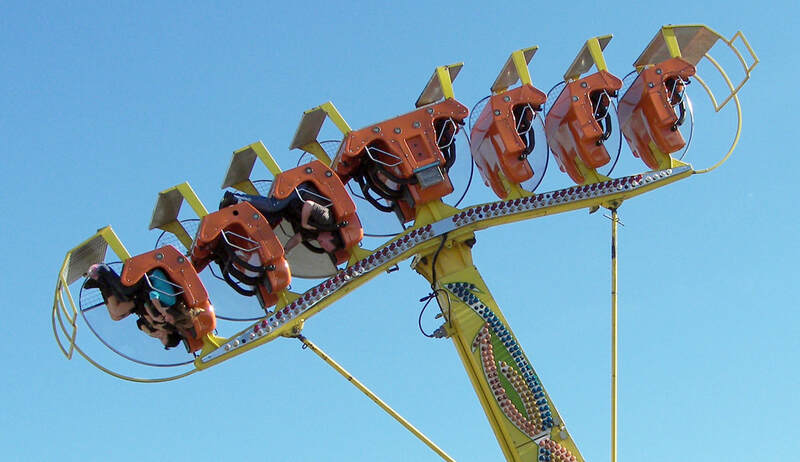 There are rides for big kids, with names like the Screamer, the Ring-Of-Fire, the Rainbow and Pharaoh’s Fury. And there are rides for little kids and toddlers. There are lots of games where you can test your skills, from basketball shooting to darts. Be sure you don't miss the bright lights and fun rides at the Carnival & Midway sponsored by Scott Manufacturing. It's fun for the whole family. Plenty of FoodFood available at the carnival is one of the things that make the festival a family affair.